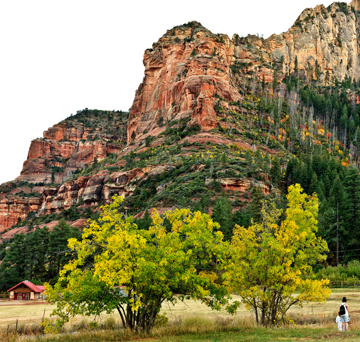 Originally a homestead apple farm, Slide Rock State Park is one of our most popular recreation spots. Escape the heat in the cool waters of Oak Creek. 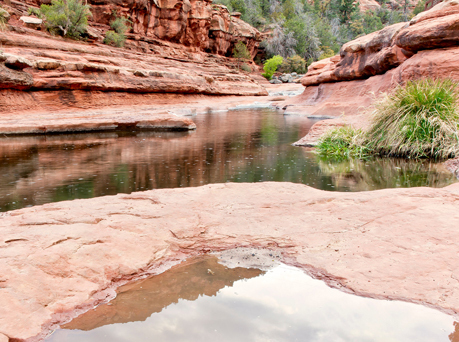 Slide Rock State Park hosts several short trails on the grounds and along the creek. Take a brief hike while you dry yourself off. Slide Rock State Park, originally the Pendley Homestead, is a 43-acre historic apple farm located in Oak Creek Canyon. Frank L. Pendley, having arrived in the canyon in 1907, formally acquired the land under the Homestead Act in 1910. Due to his pioneering innovation, he succeeded where others failed by establishing a unique irrigation system still in use by the park today. This allowed Pendley to plant his first apple orchard in 1912, beginning the pattern of agricultural development that has dominated the site since that time. Pendley also grew garden produce and kept some livestock. As one of the few homesteads left intact in the canyon today, Slide Rock State Park is a fine example of early agricultural development in Central Arizona. The site was also instrumental to the development of the tourism industry in Oak Creek Canyon. The completion of the canyon road in 1914 and the paving of the roadway in 1938 were strong influences in encouraging recreational use of the canyon. Hence, Pendley followed suit and in 1933, built rustic cabins to cater to vacationers and sightseers. Todays visitors can still enjoy the fruits of Pendley's labor. Historic cabins are available for viewing, and the creek offers the park's namesake slide for adventures seekers and those looking for a place to cool off.